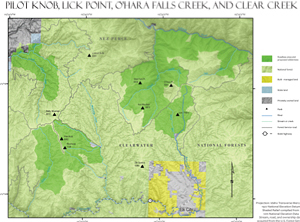 Pilot Knob, Lick Point, O'Hara Falls Creek, and Clear Creek. Click to enlarge and zoom on the map. 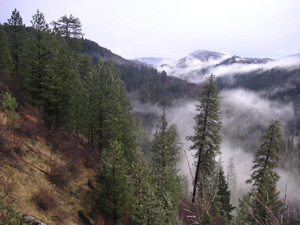 The Clear Creek Roadless Area encompasses 9,000 acres located at the head of Clear Creek along the western boundary of the Nez Perce – Clearwater National Forests. Access can be gained by spurs of Road 1842 on the north, Road 650 on the west, and Road 286 on the east, though some of these roads are closed during the general hunting season to lessen impacts on big game. The land is mountainous; elevation ranges from 2,000 to 4,600 feet, and steep slopes parallel the creek’s drainage, leading to moderately flat ridge tops. Past wildfires and resulting regrowth of vegetation have created dense brush fields of willow, maple, serviceberry, and various other shrubs, as well as young grand fir, Douglas fir, and western red cedar at the fringes. During the winter months, the thick vegetation provides a significant range for elk and moose. If you can navigate through the tall foliage screens you might find yourself on one of the overgrown trails that traverse the area. Deer, bear, and cougar are also found among the hills, meadows, and ridges. In addition, the habitats of the red-naped sapsucker, pileated woodpecker, Columbia spotted frog, and western toad overlap the drainage. Clear Creek drainage, coupled with the Silver Creek-Pilot Knob Roadless Area to the south, is yearlong grey wolf habitat. The creek itself, despite past industrial activity, remains an important habitat for steelhead, rainbow trout, cutthroat trout, whitefish, and salmon. A Chinook summer salmon hatchery is situated northwest of the area near the mouth of the creek outside of the national forest. Currently, the primary uses of this verdant region include big game winter and summer range, fishing, and hunting. Approximately 14,000 acres have been lost in the last thirty years to road building and logging. More rigorous protection is urgently needed to prevent further segmentation and misuse of this important country. Description of other Roadless Areas on the Nez Perce – Clearwater National Forests that qualify as Wilderness.